The thrilling first novel in Amazon's #1 bestselling supernatural mystery series. For fans of Sookie Stackhouse, Harry Dresden and Anita Blake, Moon Dance heralds the arrival of America's favorite new vampire detective. Now working the night shift as a private investigator, Samantha is hired by Kingsley Fulcrum to investigate the murder attempt on his life, a horrific scene captured on TV and seen around the country. But as the case unfolds, Samantha discovers Kingsley isn't exactly what he appears to be; after all, there is a reason why he survived five shots to the head. It's been six years since Samantha Moon's life changed forever. Going from federal agent to private investigator was the only option after bing attacked by a vampire. She's good at what she does but now she has to take a little more care to avoid the sun, wear big hats and keep her eye out for those who want to end her existence. While it's not perfect her husband has started to push himself away from her after learning the truth she still has an important role in her children's lives. When offered a case to solve the attempted murder of a lawyer she takes the chance getting more than she bargained for as she learns he's not the man she thought he was. Being a vampire does have it's own advantages when it comes to being a private detective. Samantha juggles being a mom and detective she finds herself in the crosshairs of a killer but he's not the only one she has to worry about. I've had this one on my kindle for years but never seemed to get around to it. I picked up the audio one day and decided to give it a shot. I like the idea of a vampire who happens to try to live as normal life as she can even if she does have pale skin, and avoid the sun. While she didn't choose to become a vampire she's not letting it control her life which I found refreshing. I found the concept interesting and the characters are easy to connect with you can't help liking Samantha as she has just the right amount of snark. 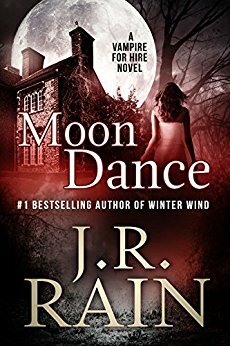 Moon Dance is a fast paced action packed mystery that kept me on the edge of my seat. I enjoyed the authors writing style it was easy to be captivated by the story. This is my first audio book so I wasn't sure what to expect when it came to narration but I liked how the reader brought real life to the characters. I've already started the 2nd one and may just be an audio fan.